*Rebound Fitness designs and prescribes the most effective mini trampoline workouts in the world. Our team of fitness experts and qualified exercise specialists at www.rebound.fitness ensure that you rebounding workouts are super effective, FUN and very motivating. *This compilation DVD contains 3 gentle workouts for the complete beginner that contains a variety of easy exercises that will burn a huge amount of calories whilst toning the arms, legs and tummy muscles at the same time. *For the best results and experience its always recommended that you do these workouts on a high quality, very low impact mini trampoline so its kind on your joints and ensures the best calorie burn. *Rebound Fitness offer a 15% cash back on all our indoor adult mini trampoline range. This includes the Fit Bounce Pro, Bounce and Burn, Maximus Pro, HIIT bounce pro and Pro Gym rebounder models. Please call 01252 833871 or email service@rebound-uk.com for more information on how to claim your 15% discount. *Following our professional rebounding workouts on a high quality, low impact mini trampoline has a myriad of health benefits such as improving pelvic floor control, detoxify the body through lymphatic drainage & circulation, strengthen joints, improve balance, tone and tighten the muscles and skin! *Lose weight quickly, safely and effectively by following our easy to follow rebound workout routines that are invigorating and uplifting. 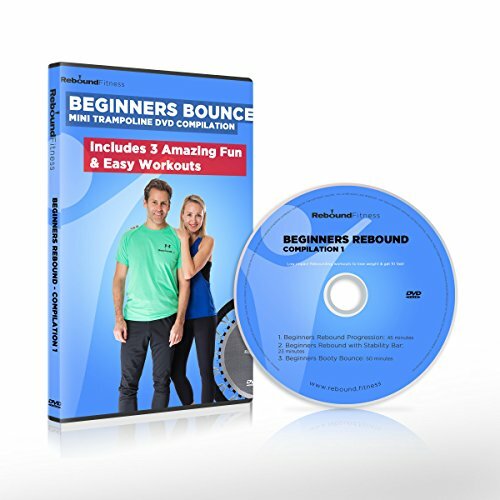 *Hundreds of more workouts available on our Bounce and Burn video membership for just $9.95 per month at rebound.fitness *Start your Fun health and fitness journey with Rebound Fitness and we'll keep you motivated along the way. It starts with just one bounce! ✔Lose weight quickly, safely and effectively by following our easy to follow rebound workout routines. Our team of fitness experts and qualified exercise specialists at www.rebound.fitness ensure that you rebounding workouts are super effective, FUN and very motivating. This compilation DVD contains 3 gentle workouts for the complete beginner that contains a variety of easy exercises that will burn a huge amount of calories whilst toning the arms, legs and tummy muscles at the same time. ✔For the best results and experience its always recommended that you do these workouts on a high quality, very low impact mini trampoline so its kind on your joints and ensures the best calorie burn. Rebound Fitness offer a 15% cash back on all our indoor adult mini trampoline range. This includes the Fit Bounce Pro, Bounce and Burn, Maximus Pro, HIIT bounce pro and Pro Gym rebounder models. Please call 00 44 1252 833871 or email service@rebound-uk.com & claim your 20% discount! ✔Beginners Rebound with stability handle bar - for the Complete beginner or older person. Anika, our fully qualified physio-therapist and ReboundUK certified instructor uses a variety of safe and effective moves on the mini trampoline using the stability handle bar. Great for increasing circulation, mobilising joints, whilst giving a gentle but effective cardio-vascular exercise and a complete body toning workout. Workout duration 23 minutes. ✔Beginners Booty Bound - Squat, sweat and smile with Errol's booty bounce workout routine. Guaranteed to get your bottom and thighs in shape and put a big smile on your face! Workout duration 50 minutes. Start your Fun health and fitness journey with Rebound Fitness and we'll keep you motivated along the way. It starts with just one bounce!